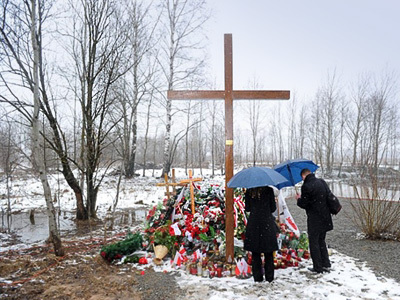 One year after the Polish president and dozens of Poland's political elite were killed in a plane crash near the city of Smolensk in Western Russia, leaders of both countries have met at the scene to mourn the victims of the disaster. The leaders visited the Katyn memorial, where the Polish delegation was heading last year, but did not reach. They were coming to Smolensk to mark the 70th anniversary of the Katyn massacre, in which over 20,000 Polish soldiers were shot by the Soviet secret police. Dmitry Medvedev has chosen to fly to Smolensk, meaning that he landed at the Severny airfield, the same airfield where Lech Kaczynski was supposed to land. Bronislaw Komorowski chose to come to Smolensk by train. During the meeting with President Komorowski, Dmitry Medvedev stated that Russia gave an exhaustive assessment of the Katyn tragedy, putting the blame for the tragedy on the Soviet leadership of that epoch. "One should have no doubt that Russia and myself as its president gave an exhaustive evaluation of the Katyn tragedy as well as who was responsible for this crime," Medvedev said. "The responsibility for the tragedy rests with the Soviet leadership of that epoch, while any attempts to put forth other versions are not based on real facts or historical documents," Medvedev said, adding that Russia's position on this tragedy remained unchanged. "This year was of special importance, as we have been able to make much progress in getting rid of lies and adopting the common view of the tragedy," Komorowski said in his turn. 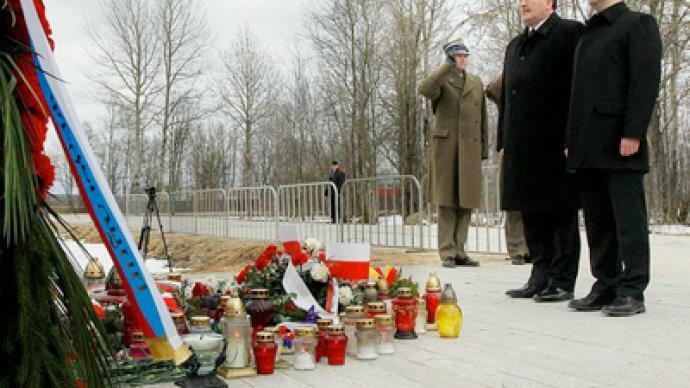 Ahead of Monday’s meeting between the two countries’ leaders, Russia and Poland set up an international group to design a monument in memory of the victims of last year’s crash. "We have agreed that an international group will be formed to design the monument," Russian President Dmitry Medvedev said. "We, the presidents, will give every support to the group," he added. Poland's President Bronislaw Komorowski, in his turn, said "the text on the monument will be in Polish and in Russian and will be coordinated by the sides." The old inscription was written in Polish and made reference to the fact that this was the spot where Lech Kaczynski died, and that he and the Polish delegation were on route to mark the 70th anniversary of the Katyn tragedy. The new one that has replaced it is now written in both Polish and Russian, and makes no reference to what happened at Katyn. 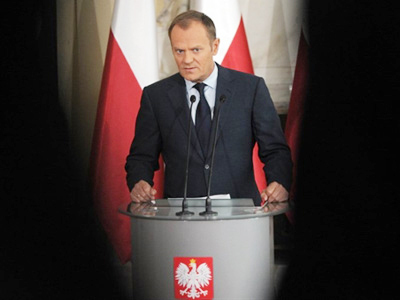 The exchange has caused some resentment among both the Polish general and political community. to commemorate those who died in the plane crash. The Russian president’s wife Svetlana Medvedeva left flowers near the Polish embassy in Moscow. The Interstate Aviation Committee (IAE) started its investigation immediately after the catastrophe and released their report on January 12, stating that the crew of flight 101 was mostly to blame, their actions obviously severely compounded by bad weather conditions, poor visibility and psychological pressure exerted by some high-ranking passengers on board. Many in Poland refuted the findings in the report, saying that much more has yet to be done to investigate the conditions of the airfield in Smolensk and the role played by the ground staff in whether they could have done more to prevent the plane from landing. The Polish side is currently conducting its own investigation. The results were expected on April 10, but investigators have asked for another six months. ­Political commentator Anton Bespalov, from the “Voice of Russia” radio station believes the majority of the Polish people do not believe in the plot to kill president Lech Kaczynski. Nevertheless, the Polish Prime Minister is currently under great pressure from “the right” and from public opinion, even if he wanted to accept the results of the investigation presented by Russia, he is in no position to do it because of that pressure. “It’s a minority of the Polish public opinion that actually believes it was a plot to kill president Kaczynski. A majority is tired of this struggle and even more tired of the political movement trying to use the plot to exploit tragedy and the sentiments of the Polish people,” said Bespalov. “The relations between the two countries are in better shape now than they were 2-3 years ago. It was a test for the two countries which they have passed,” he added.